Excellent sound, glittering lights, sky reaching screams of 2500+ crowd made Indian audience rock in Kuwait at first of its kind Bollywood event. 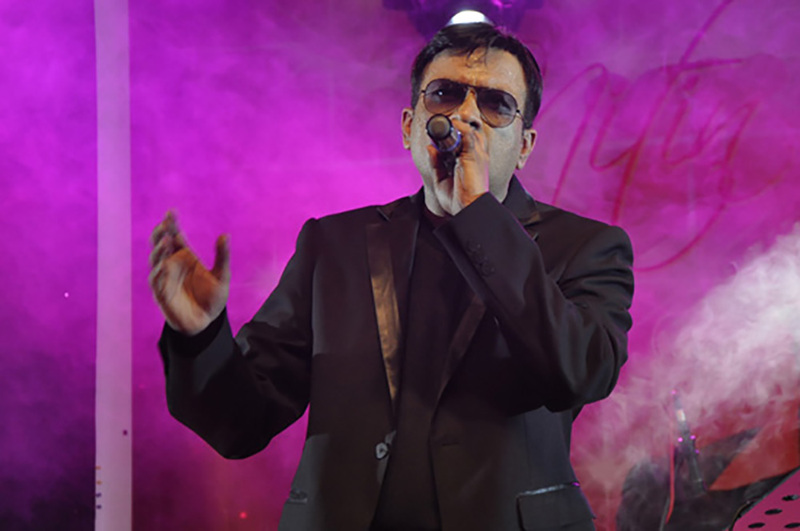 The long awaited super hit show “Sunidhi Chauhan Concert” with Indian Idol Fame Rakesh Mani as supporting male singer and Ravi Raj as anchor and mimicry artist was organized on Friday May 25 at the Mishref Fairgrounds, Hall 7. The concert, touted as the ‘Biggest Asian Show of the Year’ was organized by Creative Indians Association and Raja Company WLL. Hall 7 of Mishref Fairgrounds was converted into an ideal concert auditorium with specially set up acoustics and step-elevated seating rows so that everyone in the audience was able to soak in the atmosphere and enjoy the show. Prashanth D’Souza, President of Creative Indian Association and a veteran in organizing events in Kuwait had joined hands with Rohit G. Mirchandani, MD of Raja Company to bring this Megha event to Kuwait. After the light music by DJ Flames, main program kicked off at 7.30 pm with an introduction from the compares of the evening Lloyd and Nita followed by group dances by The Dancing Divas (Choreographer Jyothi Patel), Ground Zero (Choreographer Renji Mathew Thoma) and Fusion Dance Academy (Choreographer Shamsher and Imran). As a formal inauguration, Future Communication Center MD Salah Al Awadi inaugurated the souvenir in presence of Prashanth D’souza and Rohit G. Mirchandani. All the sponsors were felicitated with momentoes. Once visiting artist and anchor of the day Ravi Raj took over the stage, he made the audience spell bound with the performance of himself and visiting artists. The most appreciated contestant of ‘Indian Idol 5’ Rakesh Maini managed to win the hearts of audience through his magical voice and breathtaking performances. The program was well compered by Ravi Raj who is also a mimicry artist. He entertained the audience between performances with some really hilarious comedy mimicry entertainment. His friendly jibes at the Gujju, Punjabi, Maharashtrian and South Indian communities were met with raucous laughter and left the audience in splits. Enacting different Bollywood actors was simply superb. There was never a dull moment as Sunidhi had the audience dancing at their seats to the tunes of Pelhi Baar Mohabbat Ki Hai, Marjani, Dance pe chance, Deedar De, Mind blowing Mahiya, Beedi Jalaile and much, much more. She also sung some oldies and slow songs which created a romantic wave among the audience. In between songs, the entire hall rung with chants of ‘Sheela’. Without disappointing the audience she gave an electrifying performance of‘Sheeeelaaaa’. It was exactly what the entire audience had been waiting for which made it a perfect show. The concert was a treat for any Bollywood fans in Kuwait. An enjoyable mix of foot-tapping and slow songs and an exceptionally talented band of musicians, technicians and singers. Some of the audience commented at the end as it would have been nice to see both Rakesh Mani and Sunidhi performing together in some duet songs than just the solos. But without any complaints, it was an amazing evening which will remain in the heart of the audience for a long time.